Any serious Disney vacation requires planning and there is no better place than the Unofficial Guides series. Don't let the size of these books scare you (close to 400 pages for Disneyland and over 800 for Disney World). Instead, let their size inspire you. They provide a comprehensive look at every ride, show, restaurant, shop, and more in amazing detail. The first chapters include powerful insights on when to take a vacation (beat the crowds and the heat), how to prepare (start walking now), and how to make your vacation enjoyable (so everyone's not crying at the parks). Later chapters explain how to plan your touring schedule (i.e. your rides, parades, and shows) to maximize your time and minimize your line waits and provides exhaustive detail about each ride to help you determine if you should add it or skip it on your family's itinerary (including reasons why you might want to skip the Snow White ride). And because these books are unofficial, they have no agenda in promoting a specific part of Disney. They even include chapters on the competition. When I planned my family vacations, I heavily skimmed these books, but did not read every word (I'm not even crazy enough to read 800 pages). The obvious boast of the books is the touring plans that help you avoid crowds so you go on far more rides than the average line-waiting tourists. Even for those who have been to Disney before, these touring plans will change the way you look at the parks. They offer quick maps with the order of rides easily listed as well as long explanations in the chapters on how they created their tours and ways to adapt them. Because they offer more than one touring plan, it is easy to find one that works for your family. They even have a late start plan for Disney World for those of us who suffer from the time zone (its impossible to wake up earlier than the European vacationers but easy to stay up later). The touring plans alone are worth the read but are really only half the value of the book. The tips on food, motels, and time of the year can significantly change the outcome of a Disney vacation. Many of my friends see Disney as an overpriced, overstressed vacation because they go mid-Summer with no plan for rides which means long lines, hot and tired children, constant arguments over the map as to where to go next, and poor motel accommodations or dining options. A simple read of this book would avoid most if not all of those problems. Especially for those who go to Disney World on the Dining Plan, you need to read through your meal options and make at least some reservations, especially character dining. Otherwise, you will miss some of the best experiences the parks have to offer. The authors also include candid complaints about their books from readers. The most common is that families with small children cannot possibly follow the touring plans--too many bathroom breaks and the time required to parent swap which means going on large rides twice. I found the complaints to be helpful in my own planning as I saw how real people felt about different parts of the advice and then better decide what would work for my family. Also, they recognize that not everyone can take advantage of their ideas and try to offer tips on how to still have an enjoyable vacation. And you must get the latest edition! I cannot stress this point enough. Disney is constantly changing with new rides and new rules--especially for fastpass. That means last year's book is already outdated and will only give you a general idea of how to navigate the park better than your fellow mouse enthusiasts. Frankly, with the addition of a new Fantasy Land at Disney World's Magic Kingdom and Cars Land at Disneyland's California Adventures, the latest edition is more necessary than ever. Finally, this series does more than merely cover the parks themselves. They also provide incredible insight into the surrounding area. For Disneyland, most guests stay off property, so the chapter comparing and reviewing motels is significant. Once again, the latest edition will best guide you in what motels are under new management or have undergone a remodel in the last year. For Disney World, the surrounding parks (including Universal) are covered extensively. For my family, Universal's Islands of Adventures (think Harry Potter World) was more important than Disney properties and I found this Unofficial Guide to be invaluable. 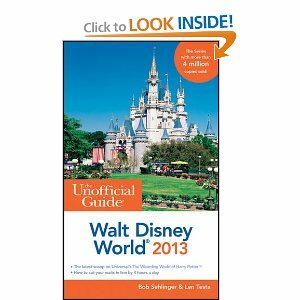 You cannot beat this book in planning your next Disney vacation. Even if you only grab one the night before and look at the map with the rides in a suggested order you will have a more enjoyable vacation. But to plan a successful Disney trip, grab a book a few months in advance and enjoy reading it while you plan and anticipate your upcoming trip.